Green is not one of the most popular colors when it comes to buying a new car. Most of us would rather go for something more neutral, like black, gray, dark blue, silver or maybe red. Green cars certainly draw attention, but might, on the other hand, bring us good luck. Besides, these are most commonly sports cars, which usually come in bright colors, are driven less and are therefore usually well preserved. 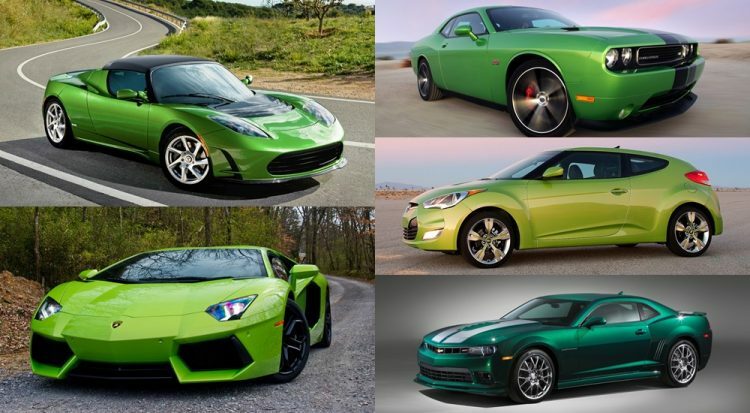 As Saint Patrick’s Day’s approaching, we made a list of five sports cars that actually look awesome in green. Tesla roadster, produced by Tesla Motors, is the world’s first high-performance electric car. It offers almost everything one could expect when sitting in such a costly coachwork: great acceleration, top stereo equipment, and a powerful engine. This car is fast and double green! Dodge Challenger is probably the most traditional American car on the market. It is in many ways a bit old-fashioned, but its interior has become perfectly refined over recent years. Green color and the classic look are the ideal combination to draw attention from just anybody on the street. There is no doubt Lamborghini Aventador, a mid-engined sports car, is one of the most expensive cars on the globe. Unlike most other cars, it looks perfect in green. If green is not your favorite, Lamborghini will paint your Aventador in just any color shade you can imagine. If you are looking for a roomy sports car with top performance, Hyundai Veloster is just a perfect match for you. It is offered in a variety of unusual colors, among which there is also a stunning Electrolyte Green. No matter which color you pick, you will enjoy a high-class interior and a wide choice of tech features. Camaro, Chevrolet’s pony car, is a great and entertaining car to drive. The last Camaro model is even smaller and lighter than its predecessors and is still considered a vehicle of high performance. Green Flash edition is without doubt the favorite choice among its fans.